Worrying is a natural emotion because people have a lot on their plates. There is a lot of uncertainty in life and many things that are out of your control. However, worrying can actually make the problems worse and increase issues like anxiety and stress. It prevents you from being able to take a problem and create an effective solution for it. It is important to make some behavior changes when it comes to worrying so that it happens less often and does not have a negative impact on happiness and productivity. Instead of taking an approach that involves worrying about the problems that you are experiencing, change your approach to one of problem solving. This is not a change that you make overnight, so it is important to be patient. Start with the smaller problems, such as organizing something in your home. Stop worrying about the lack of organization and start small with organizing one drawer. This amount of progress seems small, but it makes a big difference in how you now see the problem. Once you get going, you will find it easier to be a problem solver for the bigger things like your finances or personal relationships. a) Is the problem happening right now, or is it just a potential problem? b) If the problem is a potential one, what can you do to prepare? c) How likely is it that the potential problem will occur? d) Is the problem within your control? An example of a present problem that is under your control is a bill that has to be paid. Being able to pay the bills is a worry that millions of people share. Instead of just worrying about the big picture of not paying it, break it down to a solvable problem. Most creditors will work with you during hard times. Call them and talk to them about either getting a little extra time or breaking the bill down into smaller chunks. This will alleviate your worries and allow you to focus on things that are more immediate. Now, look at unsolvable problems that are outside of your control. It is not easy to push these out of your mind, but it is necessary. For example, you have no control over the weather, so if a storm is coming in, do not stress over how this will affect you. You can make a few plans to try and prevent things like being late to work, but overall, this is out of your control and it is something to push out of your mind. Once you know what you can solve and what you cannot, you can start making the proper plans to prevent further worries. For example, if your bills are a constant cause of worry and stress, start making a plan to alleviate this. This may involve readjusting your budget or even taking on a second part-time job to get caught up. It is important to know that you do have options and that these options will be beneficial. The changes will not happen overnight, but as long as you have a plan in place and are working on it, this helps to make your worries less powerful. In many cases, you can prevent worries completely with planning. For example, if you are starting a new semester and you are worried about your grades, just stop worrying. Create an effective study plan and make sure that you turn in all of your assignments on time. As long as you are working hard, you will find that there was nothing to worry about in the first place. 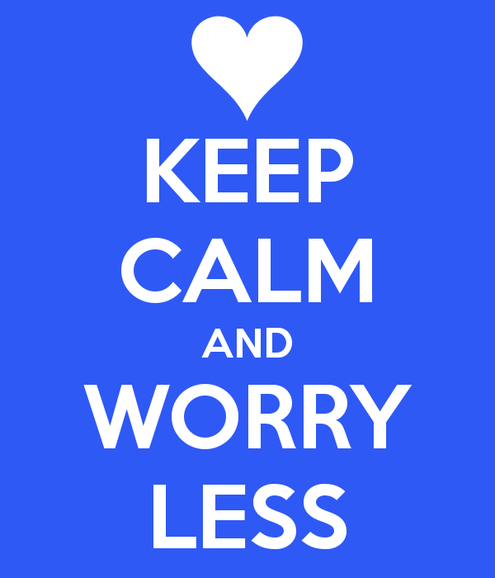 The key when it comes to worrying less is to know that you cannot make large and immediate changes. You have to start slow and gradually increase the more positive behaviors. If you start to worry, do not beat yourself up over it. You are making a major behavioral change and it is perfectly normal for this to take some time. This is why it is so important to start with the very small things that worry you because you can change these quickly. Once you see that the smaller things are changing, it gives you the motivation and confidence necessary to tackle the bigger worries in your life.